A gorilla at the Philadelphia Zoo has given birth to a healthy baby after a difficult labor that required medical techniques typically used for delivering humans. A keeper noticed 17-year-old Kira had gone into labor on Thursday. Gorilla labor is typically very quick, but by Friday, it had not progressed and she seemed unwell. Concerned about the health of Kira and her baby, the zoo brought in a team comprised of both veterinarians and doctors more accustomed to treating humans with incredible results. Kira, a 17-year-old gorilla, went into labor on Thursday but by Friday her baby had still not come. 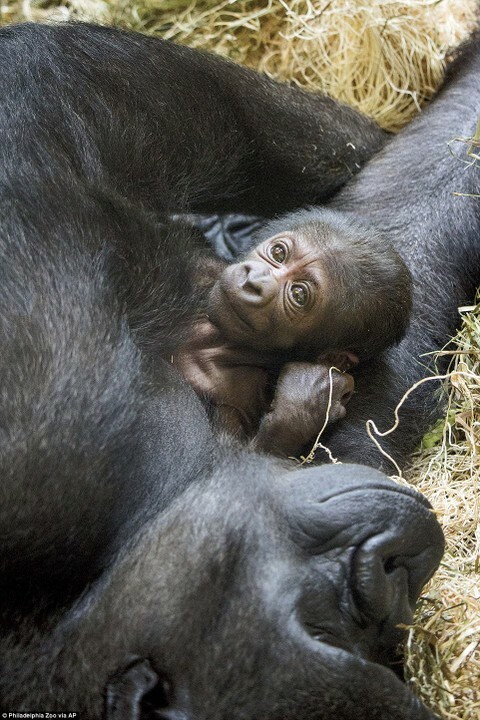 Gorilla births are usually quick, so Philadelphia Zoo brought in a team of experts. The experts included not just veterinarians, but also human ob-gyn doctors and other specialists. The baby (pictured) was delivered safe and sound. The baby was born on Friday, a day after Kira went into labor, and was checked on and cared for a day before being released to its mother. The baby a boy is seen here after being cleaned. A doctor is checking his heartbeat with a stethoscope. The boy has a step-sister, Amani. They share a father, 32-year-old Motuba. The child and his mom were reunited on Saturday and have been inseparable ever since. 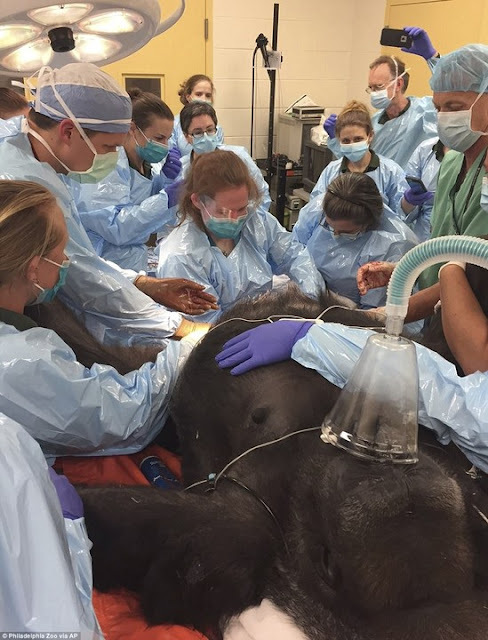 0 Response to "See The Team Of Doctors Attending To A Gorilla Giving Birth In A Zoo(Photos)"